The journey is part of the adventure as you hike through a forest—or spend a day on the water—en route to a rejuvenating soak in undeveloped natural hot springs. Soothe aching muscles and keep an eye out for passing wildlife before you return to home base. 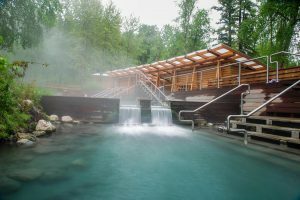 Below are three BC Parks hot springs you won’t want to miss. Feel the tension melt away as you ease into the second largest hot springs in Canada. Follow a boardwalk from the parking area as it winds through a boreal forest, and watch for moose who like to feed in the nearby warm water marsh. Open year round, Liard ranges from 42 C to 52 C, and it is home to a new change house and washroom facilities. How to get there: Liard River Hot Springs is located at kilometre 765 of the Alaska Highway, approximately 3.5 hours northeast of Fort Nelson. 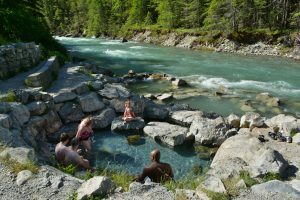 A favourite among campers and wilderness adventurers, Lussier Hot Springs is set along the icy, swiftly moving Lussier River. The top pool (fed by the springs) can get as hot as 44 C, but as the water flows down to other pools, the temperature decreases. Two bathroom/change room buildings are located in the parking lot. How to get there: Access Whiteswan Forest Service Road from Highway 93/95 just south of Canal Flats. The hot springs are located near the western boundary of the park, at kilometre 17.5. A short, steep hike takes you down to the Lussier River. Use caution in winter months, as both Whiteswan Forest Service Road and trail access to the hot springs can be quite slippery. Clayoquot Sound’s Hot Springs Cove is located off the west coast of Vancouver Island. A popular day trip from Tofino, these geothermal hot springs cascade down a waterfall into half a dozen rocky pools. The hot pools flow from one level to the next, gradually becoming cooler as spring water mixes with ocean swells. Average temperature is 50 C.
How to get there: Several companies offer boat and floatplane tours to Hot Springs Cove, which is accessible only by water or air. From the dock, enjoy a 30-minute walk along the wooden boardwalk trail that wends its way through old-growth rainforest to the hot pools. Have access to your own boat? Check out these marine hot springs located in BC Parks. Great post. Creativity is the thing which you must need in each and every field! Thanks for writing this great post ?